Why have goats? Because goats are friendly, social animals that can clear out brush and will eat things that cattle and sheep won't eat. They are good for 4H, show, pets, pack animals, milk and meat. They are fast growing, reaching a kill weight of 100lbs in approximately 8-12 months. Their meat is lean and nutritious, containing less calories than chicken and packed with protein. (Click here for a chart showing nutrient composition of goat vs. other meats.) Goats are great for filling your freezer with fresh meat for your family, without taking up as much pasture space as cattle would. When they aren't feeding your family, they are very useful creatures! They will keep the blackberry vines and other weeds in check. (Click here to watch a video about goats eating down noxious weeds!) Their small pelleted manure is perfect for fertilizer for your garden. And they are a hoot to watch romping around the pasture when they are young, making them good for a laugh. Kids, especially, love to climb and jump off of things. Sometimes jumping and standing on the back of their mother or siblings! If you have a dirt pile or an old fallen tree they will love playing King of the Mountain with their fellow kids. Goats are great for kids 4H projects because they are easy to handle for a petite person. They are also smart and can be trained fairly easily. Because they don't need as much room as cattle or horses, they are a perfect 4H project for someone with limited space. Boer goats and Kiko goats are typically looked upon as only meat goats, but they also produce delicious milk. Just not near as much as a dairy breed would. Of course the amount of milk produced varies between individual goats (One of my Kiko girls looks like she is trying to have a dairy bag! lol). If you are interested in both meat and milk, the Boers and Kikos do well as dual purpose breeds. Meatier and well muscled, but still able to produce sweet, easy to digest goat milk. 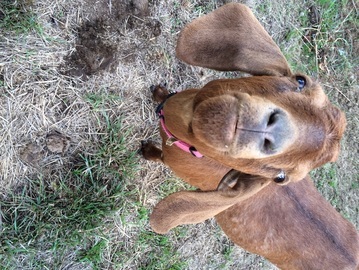 I love having goats because they are useful, but also because they make me smile. Raising animals is sometimes a chore, but it is work that is well worth it when you walk into the barn to see newborn kids in the golden straw getting licked clean by their mama. It is worth it when you see those little doelings and bucklings bounding around the stall jumping off the walls. It is worth it when you see them eating their first blades of grass in the springtime. It is worth it when you see human kids meeting a goat kid for the first time. The smiles! It is worth the trudging through the snow in the wintertime hauling water buckets to make sure everyone has something to drink, when you get to see your little goat herd snuggled up sleeping in the barn on a chilly night. Raising animals is work, but choosing to raise goats is one of the best decisions I have made.